One of the perks of this job is being able to interview legends of the sport and Sebastien Tortelli is certainly one of them. With two world motocross titles and a 250cc supercross race winner as a teenager before leading the 250 nationals three seasons in row in the states, Tortelli on his day was the fastest guy in the world and one of the few men who can say they beat both Stefan Everts and Ricky Carmichael straight up in their prime. So when we spotted him in the pits of the Belfast Arenacross, now coaching the next generation of riders, we decided to catch up with the friendly Frenchman to see where life has taken him since his racing days and to get some thoughts on the current stars of today as well as some reflections on his own career. Welcome back to Belfast, you were here in 2005 and won, what do you remember of that? It’s a smaller track than a supercross! Yeah it’s a smaller track, but the chance to be able to ride in Europe indoors, it’s great, the sport has to develop in any conditions and they do a good job on the track. Back in the day it was the same and they were able to make a good technical track and today that what is we see too. Yeah, he comes from the 85 and this is his first race on the big bike, he’s a little bit small still for the bike, he is only 14 so it will take more time for him and I think he will be better and better as the season goes on and he will gain confidence one the bike. He doesn’t seem to do as much outdoor racing, but he is very good at supercross, is his plan to go to America? I don’t know what his plan is completely but his focus is supercross and that’s what he has been doing for a while now, mainly supercross and not so much outdoor races. I think outdoors is important to develop speed especially corner speed, so he will do more outdoors but the focus is not on racing outdoors, the focus is more racing supercross. You are back here (Europe) doing coaching, do you enjoy it? Yeah I work with Soub and Nick Thury also, (in the Fro Systems team), I moved to Spain two years ago now and I like it a lot and I have been to quite a few some GPs also. It was time to go back home, the family is not getting any younger so it was the time for me to go back home. You went to America and did supercross but by 2003 you really showed a lot of improvement, what made the difference? The tracks are way different, so obviously if you ride here you have to move to the US to ride the US (style) tracks. I raced the French championship, which is raced similar to here, more Arenacross in style. When you go to the US and you have football field stadium style you have a lot more speed and the only way to be good at that is to be there. It’s hard to transfer back here too when you come back because it is not the same type of racing so you adapt to whatever championship you decide to do. You have to commit and get enough time, a couple of years, to be good at it. Did you find it difficult to come back to the GPs then from America? No, the GP’s made a great improvement in organisation and professionalism and I think the motocross scene is the GPs and the supercross scene in the US. I think we now have a very clear two worlds. The best in motocross is GP and the best in supercross is the USA. At the Nations the styles even looked different, the Americans were a lot more aggressive and the GP guys carried more momentum, do you feel that difference is from supercross? I think the teams focus a lot more on supercross and put a lot more money into supercross so the effort and development of the bikes is a little bit more focused on that side. When you see the GP guys, who don’t do supercross, all year long it’s sand and mud and all these tough conditions for outdoors that the US guys aren’t used to, so that’s why I think today we can see a big difference in outdoors and supercross. The battles between Tony Cairoli and Jeffrey Herlings the last couple of years reminded me of your battles with Stefan Everts in 97 and 98, do you see the parallels with the young guys coming in with momentum and speed and with the reigning champ? Every generation has a battle. Cairoli is not the same generation as Herlings so a lot of respect for Antonio because he is not as young as him. So you know at the end of the career you have to spend more attention recovery because you don’t recover as quick. But yeah, hopefully this year the racing will be a little closer together and it will be better for the crowd but I think Herlings really killed them last year and that was a little bit of a wake up call for all the guys and I hope to see some closer racing this year. What do you feel is his secret is to having that edge on everyone? I don’t know if there are any secrets, the base is work and he does a lot of work and a lot of riding. He came a little bit different with more focus on a lot of riding and less of off the bike training, that has been working for him but now the question is how long will he be able to handle as much riding as he is doing because he is a guy that spends a lot of hours on the motorcycle and it is tiring not only physically but mentally. He is at the highest of the sport and he has proven he is the fastest by far, so the question is can he do that for a long time or will he change his training regime with age. I don’t know, but today he has proven it is the right thing (all the bike time) to do for him. What are your thoughts on the UK Arenacross so far? I think the way they change the series with the 250 and 450s is pretty interesting. There are less riders but with better competition so for me, Matt is doing a good job and going in the right way and on top of that he is bringing younger riders through the junior series so after a few years he is finding his mark and bring something for supercross to England. For me I think he is doing a great job and you have a lot of good riders who are here and they are racing hard so it’s good for them also. In America they have had two rounds and two different winners, what are your thoughts on the series over there? It’s early to say what is going to happen and how it’s going to be. I think Cianciarulo, it’s about time for him to win the West coast, he is plenty fast and plenty talented enough for it. And with Eli Tomac/ Roczen etc who is your favourite for the 450 class? I am French so I would like to say Musquin, I think Tomac will have a different season this year, a better season because he didn’t commit suicide in the first race so that’s already a plus! I think that’s what was missing from him, to maybe start a little bit slower but come back stronger. Anderson is not looking 100% I think maybe he is coming back from a broken collarbone, Musquin is not 100%, I think Roczen has a good shout I would be happy to see Roczen on to go the podium at the end of the year, the guy deserves it after all the pain he went through, he really deserves to win the championship. Tortelli on the 450 Suzuki in 2005 in USA. When you were on form you were probably the fastest guy in the world, you could beat Stefan Everts and Ricky Carmichael and had amazing corner speed, what was the key to that?! Maybe a few crashes and a lot of work! I don’t know I think it’s perspective and confidence – having no doubts. I would say I was able to feel the bike and trust it and be able to go in the corner fast. I think it comes from training, you see today the guys ride a lot more standing up because they ride a lot more in the sand so it’s a little bit different as far as techniques. I think every generation has its plus, for me these guys training in Holland and Belgium in the sand so the technique changes and tracks change too, we have more rutty tracks than before. Before we had hard-pack, rutty, different soils, now it looks like it’s pretty even all the way across. That’s the way it is, that’s the evolution, the tracks look more like we used to have in the USA so it’s good for competition. When you went to America you obviously went as world champion in 1999, and I remember David Bailey and Davey Coombs saying about your work ethic and how you’d raised the bar after you won both motos at Glen Helen. How did that feel to go over there and win straight away and lead the championship? The first year I would have had the championship if Doug Henry didn’t take me out and break my wrist, so that was a disappointment. 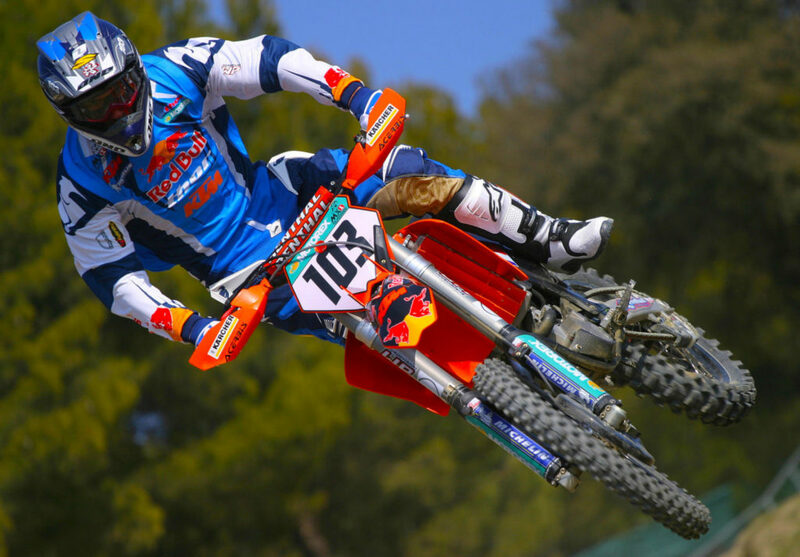 But I think every generation has a guy that raises the bar and that’s what I think we see with Herlings. He came to the GPs when everything was settled down and Cairoli was at the front and then he was able to bring the youth in and push it to a higher level, but then everybody wakes up and catches up. The sport is always in evolution and progresses and progresses, if you are not riding you are losing time and losing speed, you have to be on the bike. Injuries are the worst nightmare of every rider because on top of not riding you are losing the speed you should be gaining every year. Ricky Carmichael came in and dominated the 250 class in America, obviously you had his speed (outdoors) but you kept getting injured, did you ever wish you could have raced him in the world championship? I mean, I think you have to separate both worlds, I went into his theatre, where he had his background and his habits so on top of racing him I had to find myself there, it’s a higher work and challenge. But I am the one who made the choice to go race him! I could have stayed in Europe and raced Stefan for a couple more years and be a world champion again but that was not my goal, my goal was also to be a works rider also at supercross and I had to commit to go to the US and race on their turf, that’s the way it is, it’s the extra challenge. More guys did it, Chad did it, a lot of good guys did it. I think at the time the highest level for me was the US, today you can consider the world championship the highest level for motocross, so it’s a rider’s choice and a rider’s decision for his career. At that time I thought my way to do it was the only way. Carmichael came in and did it his way with the intensity, did you change anything to try and match him or did you stick with your programme? No actually I am the one that changed his intensity! (Smiles) He was a little small and a little fat until I started beating him on the big bike and that kind of changed when Aldon Baker came into play to raise his intensity. I have to give hims props on that one because he was able to change his way of life to compete on the highest level and you have to have respect for him, he changed all his habits to beat me and be there and fight. What can I say, he made the right choice. Was that frustrating at that time? I think you led the 250 outdoors championship three years in a row, even against Ricky, but injuries or bike issues always seems to give him that edge and momentum? Yeah I would say a little more injures because at that level we were really pushing really hard. That was for sure for me some of the issue and then on top that bike problems that happened also and I lost good points to him on that side. I ran out of gas also so a few things like that, I passed him, pulled away then ran out of gas and gave him a 20 points lead when I was supposed to gain points so that was rough but that’s racing, what can I say. To this day I regret that I did not win a US championship but I had to move on. How would you compare Ricky Carmichael and Stefan Everts in terms of a rival and a challenge? For me it was harder to ride against RC because we are very similar, the same type of guys, the same attitude and work ethic where Stefan is more relaxed and his riding style was more relaxed. Stefan had a great work attitude also but not the same style so when you fight against yourself (RC), it’s harder!